Immediately, we know we're in the future because everything is utilitarian concrete and glowing blue lights. Computers are integrated into tables, with whole-hand touchscreens that read your fingerprints to log you into The Nether. The mysterious-sounding application is, yes, the Internet, but it's the Internet of the future, parceled out into "realms" created by folks who almost certainly spend more time online than they do interacting face to face. The most notorious of these realms is The Hideaway, built and managed by a man known as Papa (Aaron Roberts). It's a quaint — and astonishingly lifelike, in every sense — Victorian mansion where guests chatter with adorable children in frilly frocks and then do unspeakable things to them. This darkest corner of the Internet has caught the attention of detective Morris (the stern Allison Pistorius), who hauls in Papa for interrogation. Playwright Jennifer Haley reveals just enough in her compact script (the play runs only 70 minutes) to hint at the wasteland Earth must have become in this unspecified future. We could be decades down the line, or this could be taking place next year. 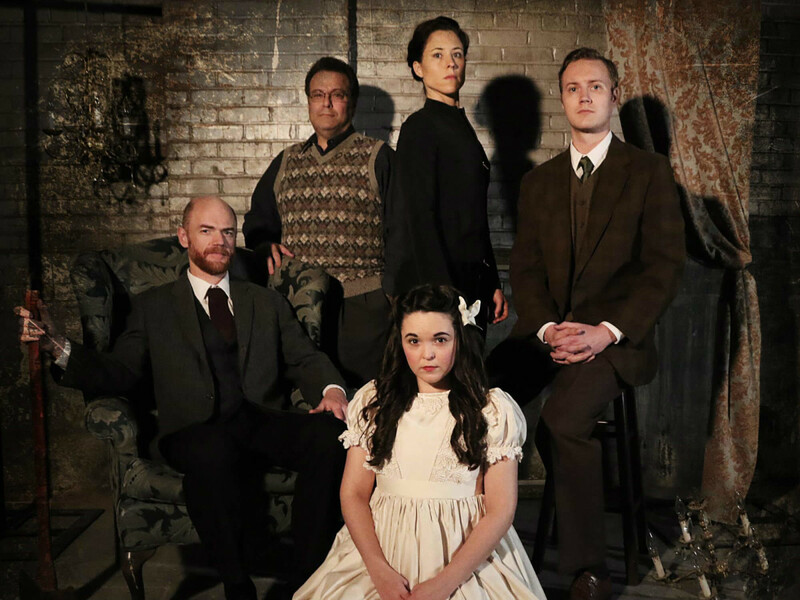 Either way, Stage West has concocted two equally creepy worlds, with Morris digging into The Hideaway and flashbacks taking us into the refined rooms where the horrible acts occur. In this alternate space we meet Iris (Jad Saxton, unnerving as a porcelain doll of a girl whose dainty curtsey belies a sharp mind). She's devoted to Papa, but finds herself forming a friendship with Mr. Woodnut (gentle Blake McNamara), who visits regularly but rarely reaches for the ax. Frumpy teacher Doyle (Randy Pearlman, whose panic is almost tangible) is also caught into The Hideaway's web, but he's no match for the relentless questioning from Morris. Director Garret Storms lulls us into forgetting that these are actually avatars, hiding the real faces and intentions behind courtly bowing and dignified brandy sipping. Morris proclaims that The Nether is no longer a Wild West that's running from rules and punishments, but it's terrifying to see how this realm — built from complicated code yet offering much more reality than the present-day world is capable of anymore — has asserted its power. Nate Davis (set and projections) and Luke Atkison (lighting) give balanced attention to both worlds, utilizing rolling walls almost like theater curtains to reveal and then shut away The Hideaway. Each time they part, you're not quite sure if the tableau you'll be greeted with is dream-like or nightmarish. At Stage West, both options are sublime. The Nether runs at Stage West through April 10.